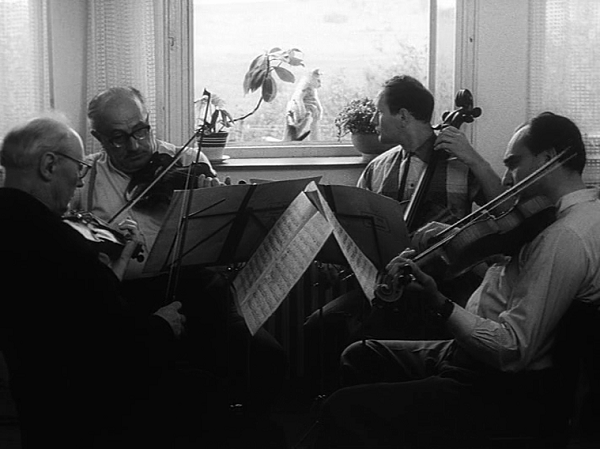 Bambas (Karel Blazek) plays in a small, rural orchestra. For an upcoming concert, a soloist is visiting: Bambas’s old friend Peter (Zdenek Bezusek). Peter, who is with a more prominent orchestra in Prague, arrives with his girlfriend Stepa (Vera Kresadlová) to stay with Bambas and his family: his wife Marus (Jaroslava Stedra), two children, the grandfather (Jan Vostrcil) — also a violinist — and grandmother (Vlastimila Viková). Over the course of a day and a night, Bambas and Peter attend a local funeral/wake, have dinner, practice a Mozart string quartet with the pharmacist (Karel Uhlik), and get drunk. This is one of those movies that’s been on my watchlist for ages but I really didn’t know anything about it going in. Perhaps no expectations is the best way to approach this simple but charming little film. Ivan Passer — directing his first and only Czech feature before coming to America — steers clear of things like a storyline or dramatic conflict. He doesn’t even show us the concert at the end. Instead, he focuses on breezy anecdotes. The grandfather talks about an old sexual conquest. Grandmother demonstrates how she keeps her belly flat. Bambas and Peter compare their wives’ snores. Stepa flirts with a simple-minded man passing by. It all has such an easy-going tempo that it goes down smoothly. As far as film movements go, Czech New Wave is one of the lightest and most comedic, and this movie is a shining example of that. Shot in glorious, hazy black and white with warm, cozy shafts of light. Kresadlová brings an infectious playfulness and Vostrcil is a hoot. And the two leads are musicians, not actors, which enhances not only the reality of their playing but also the naturalism that pervades the film. Music is both a vocation and a hobby for these people… the rehearsal of the string quartet is loaded with friendly back-and-forth critiques and commentary. Music is present not just in the performances of Mozart and Jirovec, but also the funeral procession and the opening scene of the rural orchestra practicing, not to mention the musicality of dinnertime sounds, Stepa’s laugh, and snoring. This entry was posted on May 5, 2015 at 8:26 pm	and is filed under Movie Reviews. You can follow any responses to this entry through the RSS 2.0 feed. You can leave a response, or trackback from your own site.